Accurate state estimations are perquisites of autonomous navigation and orbit maintenance missions. The extended Kalman filter (EKF) and the unscented Kalman filter (UKF), are the most commonly used method. However, the EKF results in poor estimation performance for systems are with high nonlinearity. As for the UKF, irregular sampling instants are required. In addition, both the EKF and the UKF cannot treat constraints. 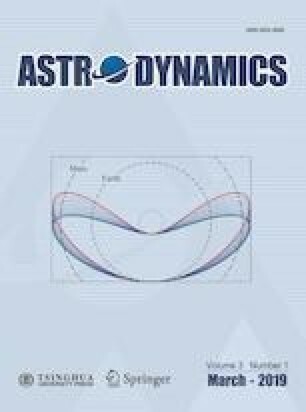 In this paper, a symplectic moving horizon estimation algorithm, where constraints can be considered, for nonlinear systems are developed. The estimation problem to be solved at each sampling instant is seen as a nonlinear constrained optimal control problem. The original nonlinear problem is transferred into a series of linear-quadratic problems and solved iteratively. A symplectic method based on the variational principle is proposed to solve such linear-quadratic problems, where the solution domain is divided into sub-intervals, and state, costate, and parametric variables are locally interpolated with linear approximation. The optimality conditions result in a linear complementarity problem which can be solved by the Lemke’s method easily. The developed symplectic moving horizon estimation method is applied to the Earth-Moon L2 libration point navigation. And numerical simulations demonstrate that though more time-consuming, the proposed method results in better estimation performance than the EKF and the UKF. The authors are grateful for the financial support of the National Natural Science Foundation of China (Grant No. 11772074).